Friday has been an extraordinary day! Dicky took a pass on the morning drive courtesy of a cranky, fussy two year old, so Salim and I headed off to the park on our own. You wouldn’t believe the stares I got – a gypsy and one of the senior guides all to myself! Especially from the people packed into the “canters” basically open air buses which hold about 20 people. 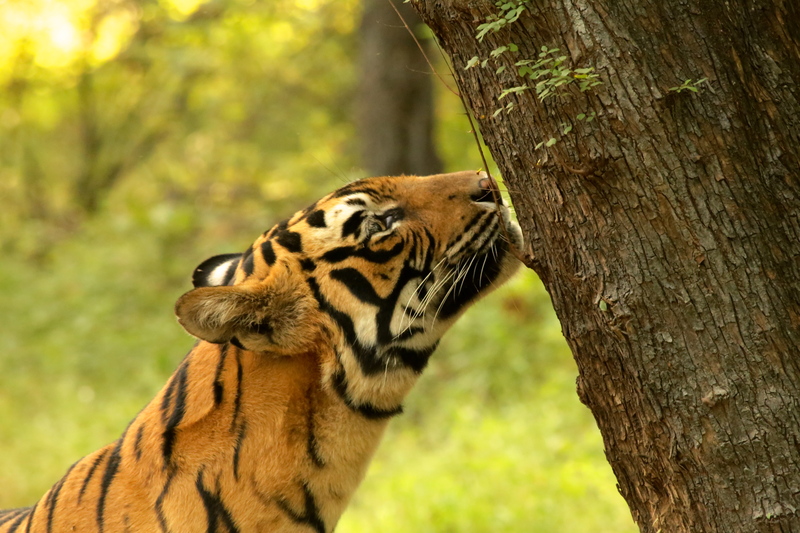 We hadn’t been in the park an hour when we had our first brief tiger sighting – the two & 1/2 year old cub of T19 ambled between my gypsy and another and into the forest. That was cool but Salim just got this “look” and headed us off down a different road. 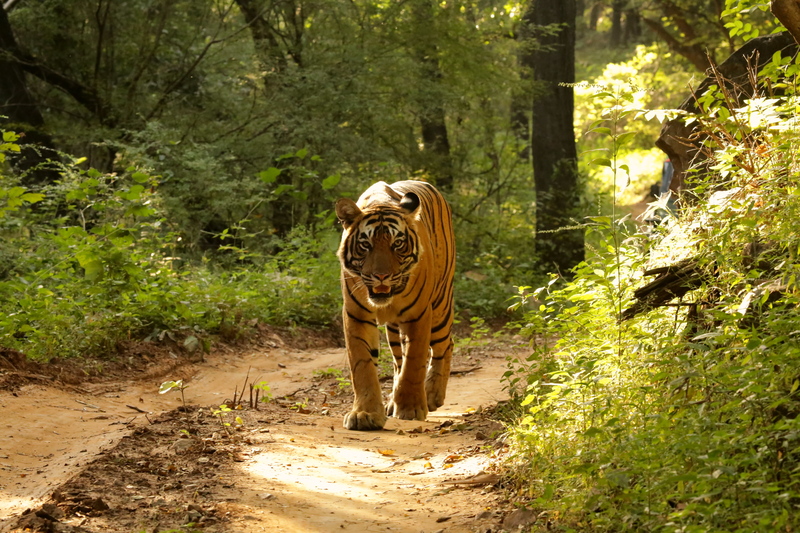 After a short wait, the tiger appeared, and spent at least half an hour keeping us company! 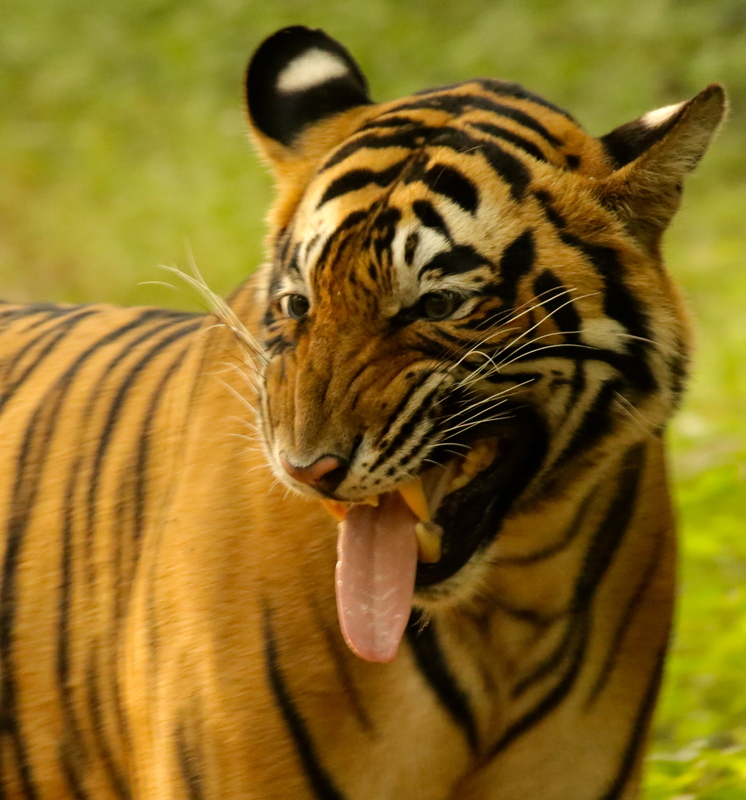 He sniffed trees and gave us a fine display of flehmen (sp?) behavior; where they scrunch up their faces to draw a scent over two small holes behind their teeth. It looks quite comical if you can say that of a cat who weighs about 150 kilos! 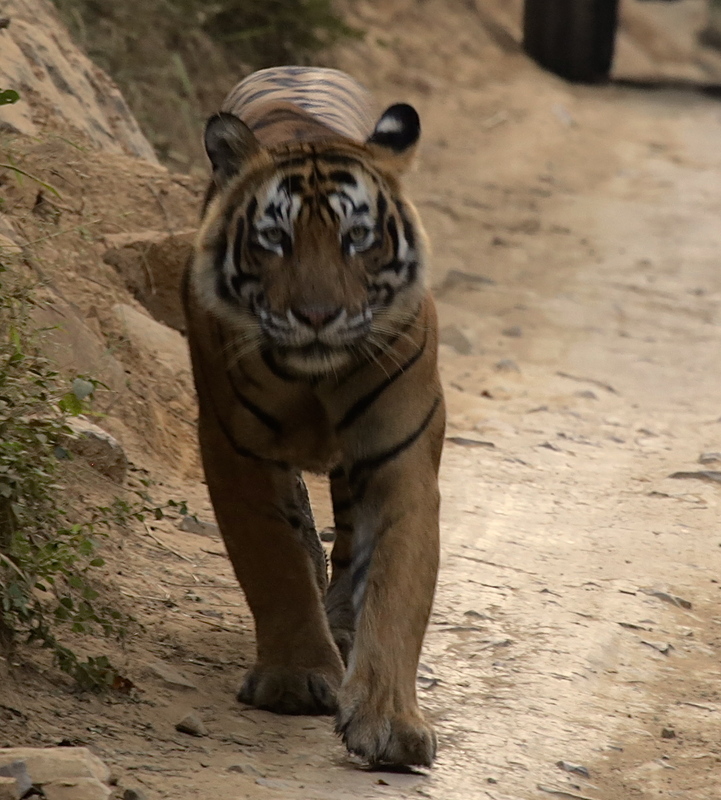 He then quite leisurely meandered down into a little valley, up and across to a small rise and then proceeded to follow our vehicle for a good kilometer or so. At one point he was so close behind our gypsy I could no longer focus on him with my telephoto! And there was no way I was going to stop and change lenses! I made a couple of really good shots and one “for the money” photograph which will be taking pride of place somewhere prominent at home. I felt like I had been given this precious gift and I literally could not stop grinning – felt like a bit of an idiot actually until I looked at Salim and the driver – and they both had that same grin on their faces too. I guess it never gets old! 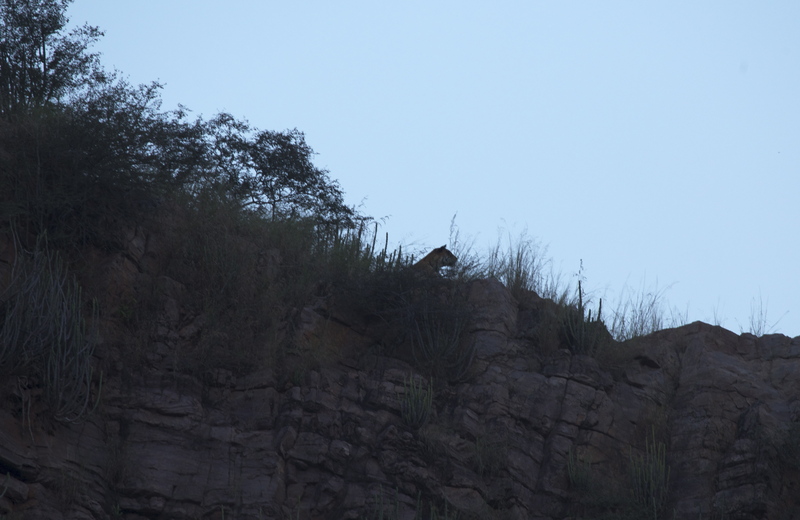 The afternoon drive while not as exciting did give us a glimpse of T19 high up on a ridge and Salim got a fabulous silhouette with my camera which I will share with you shortly! This morning – Saturday – I was supposed to take the sleeper train back to Delhi. Decided to fly back instead so had time for another drive at the park. 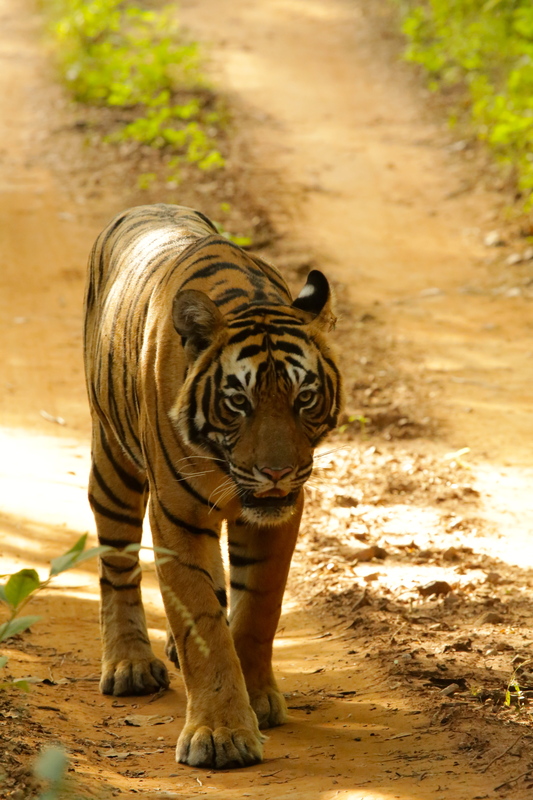 Again just Salim and I and we saw one of the dominant males – T25 walking down the road behind us. Virtually the same pose as the youngster the day before but a world apart in attitude. This is a male in the prime of his life, he has an enormous territory and has actually killed a couple of people apparently. A ranger who got too close to a kill I think and a couple of villagers who were where they weren’t supposed to be – poaching possibly? Interestingly the remaining rangers refused to allow him to be destroyed. I didn’t know all this until afterwards but he definitely and very clearly had a whole world of difference in his eyes. We weren’t getting QUITE as close to this fellow…. I think Salim and your driver were grinning so much not because of the tiger, but because it brings great pleasure when you can share your world and make someone else happy, as you were!